If you are ever within a few hours drive or less during the Tulip Festival in Holland Michigan, you have to go. 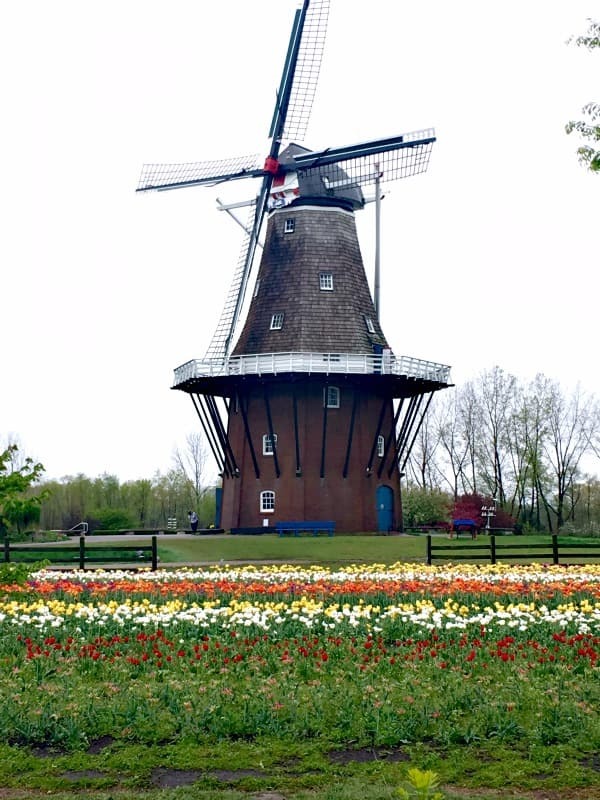 Holland is a pretty area, but when the tulips bloom it shines even more brightly for locals and tourists alike. 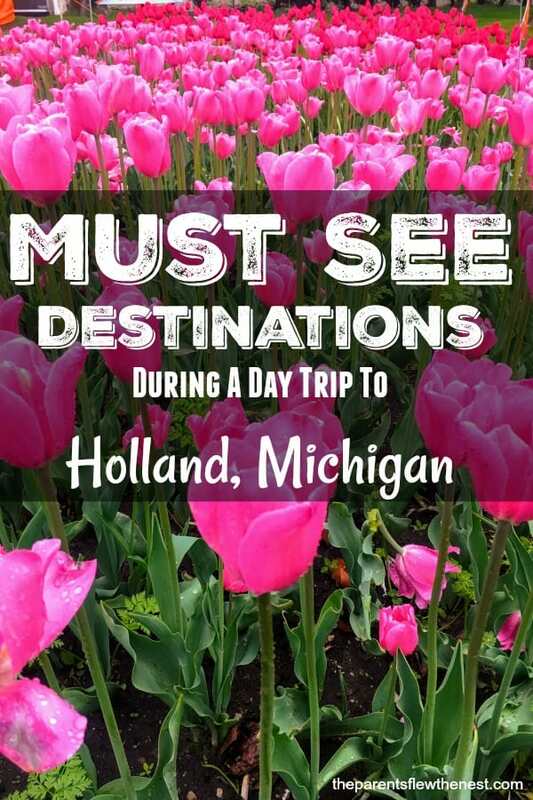 And don’t stop at viewing the blooms of the Tulip Festival–make sure to take in a few more sites Holland has to offer such as Big Red, Tunnel Park, and Mount Pisgah. Holland was our May date day destination. We only had a day to explore due to a busy month so we left our home in Marion, Indiana early in the morning and made the 3-hour trip up to Holland, arriving around 9:00 a.m. 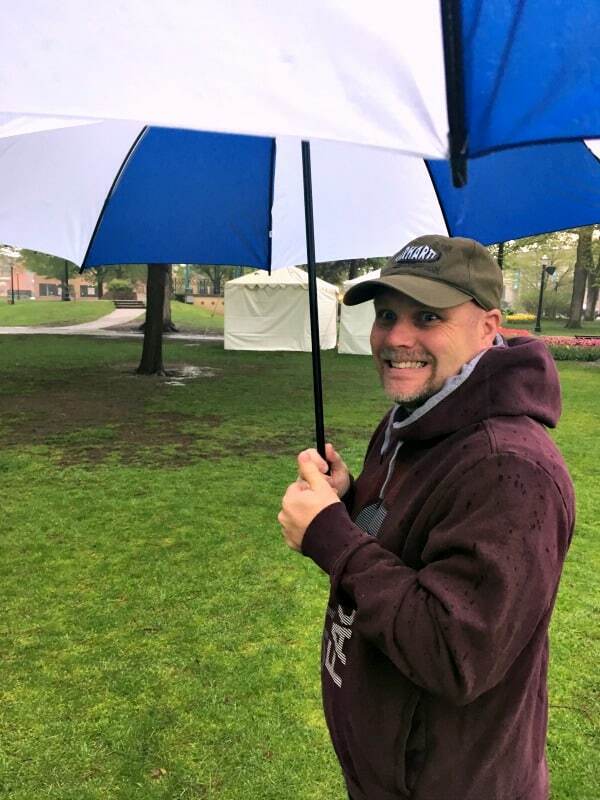 This year we have transitioned to date weekends instead of date days, but May was graduation month for our son and that meant the weekends were packed. That is just how life is sometimes in this busy stage of life. All too soon our nest will be empty and most weekends we will be free to explore–and I am sure that although we will love the increased time to travel, we will also miss having the children in the nest. This man LOVES tulips. 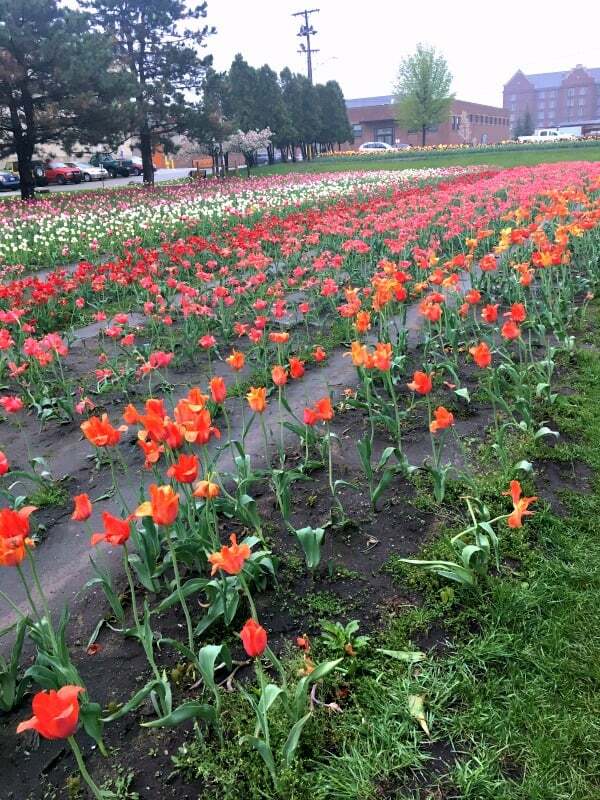 And even though we got to Holland a day after the Tulip Time Festival had ended, the city did not disappoint him–tulips were in bloom everywhere. My husband knew that, though, because he had been following the Holland Tulip Tracker live video feed for weeks. So rain or no rain we were going to see those tulips. But not until we stopped at Dollar General and bought two umbrellas. Our first stop to view the tulips was Centennial Park right in the heart of downtown Holland. This park is bursting with tulips in bloom during the annual festival. 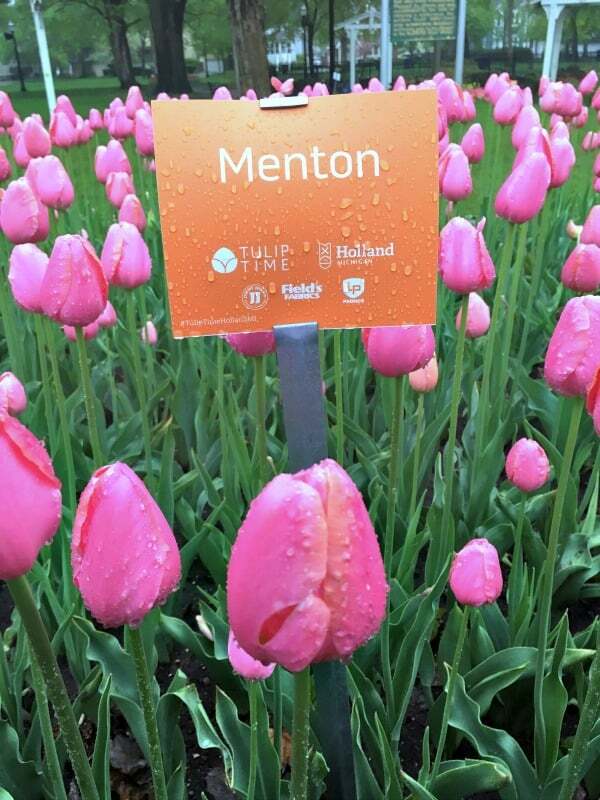 Before we started going to the tulip festival, I had no idea how many different varieties of tulips there were so I appreciate how each type of tulip is labeled during the festival. During the festival, the main street of Holland is blocked off to traffic and opened up to festival events such as a parade and Dutch dancing. 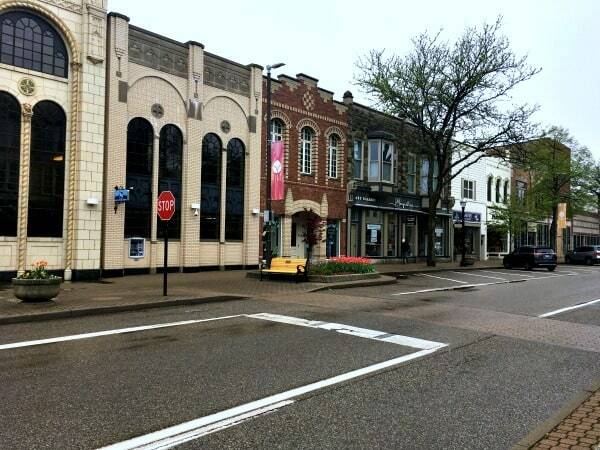 I love the downtown area of Holland even when it isn’t all dressed up for the festival. It has some beautiful architectural buildings, unique locally-owned restaurants and shops, a collection of statues and a friendly small-town vibe to it. It is worth spending a bit of time walking its streets to do some window shopping, statue viewing, and eating! Centennial Park isn’t the only place to view the tulips during the festival. 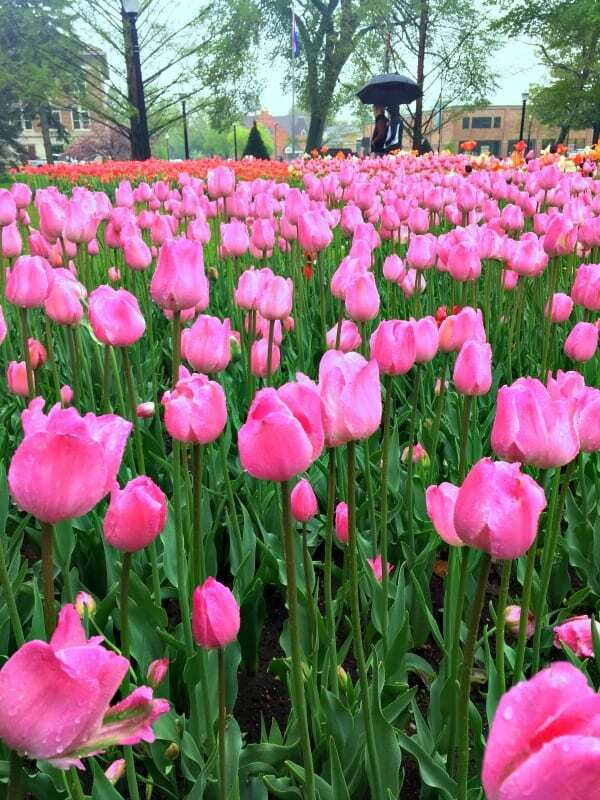 There are millions of tulips to view all over Holland, Michigan. Another favorite spot to see many is Window on the Waterfront. 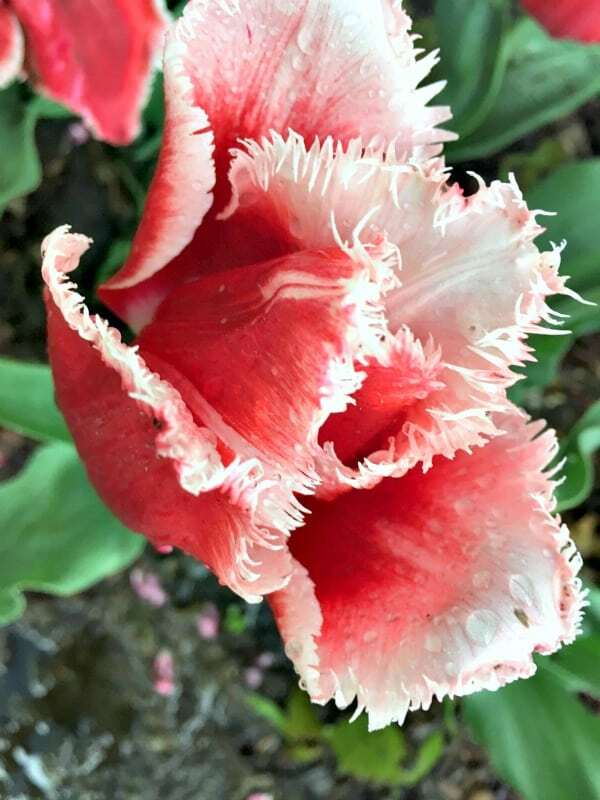 Window on the Waterfront is a 30-acre area park along the marsh near the downtown center of Holland with walking/biking paths, a baseball field & of course, thousands of tulips. 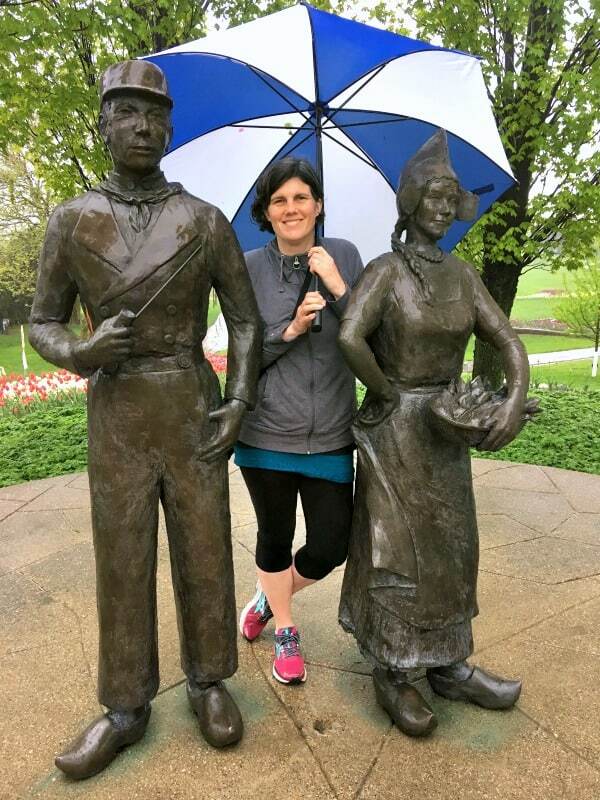 Near the entrance of the park, you will find Greertje and Cornelis, life-size bronze statues of a couple dress up in traditional Dutch clothing done by artist Billie Houtman Clarke. Holland has over a dozen statues created by various artists all over town. You can get a map to guide you on a statue tour at their visitor center. 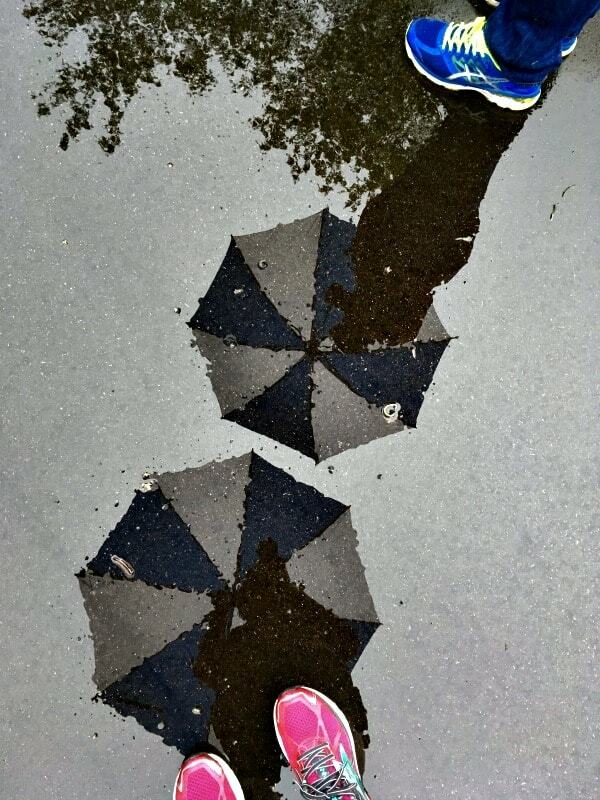 Just after we shot this puddle picture the rain finally stopped and we were able to put our umbrellas away for the rest of our day of exploring. 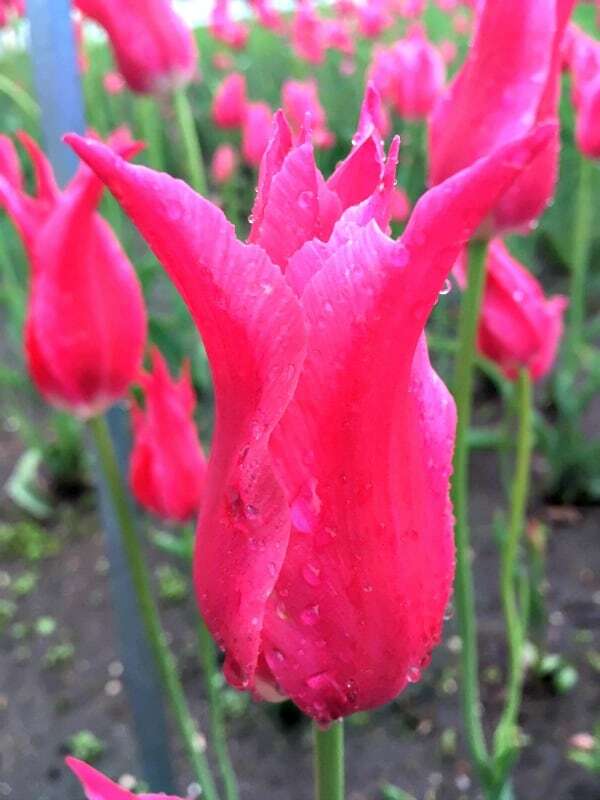 We spent quite a while viewing the fields full of tulips and those along the walkways found in Windows on the Waterfront before we decided to walk into town and do a bit of shopping for new Birkenstocks for both of us for the upcoming summer season. I got the same style I have enjoyed for several years in a row and Jack got this classic Birkenstock style. After shoe shopping we headed off to Windmill Island Gardens to enjoy some more tulips and a tour of the working flour mill. There is a small admission fee to walk around the gardens and enjoy the windmill tour. This is our second time paying to get in as we enjoy the huge field of tulips as well as the windmill tour. However, we both agreed that unless we bring people who haven’t been to the festival with us next year we will probably skip this area as paying to explore it a third time probably wouldn’t be worth it. The windmill on Windmill Island was brought over from the Netherlands in the 1960s and is in full working order as a flour mill. It even has its own miller. 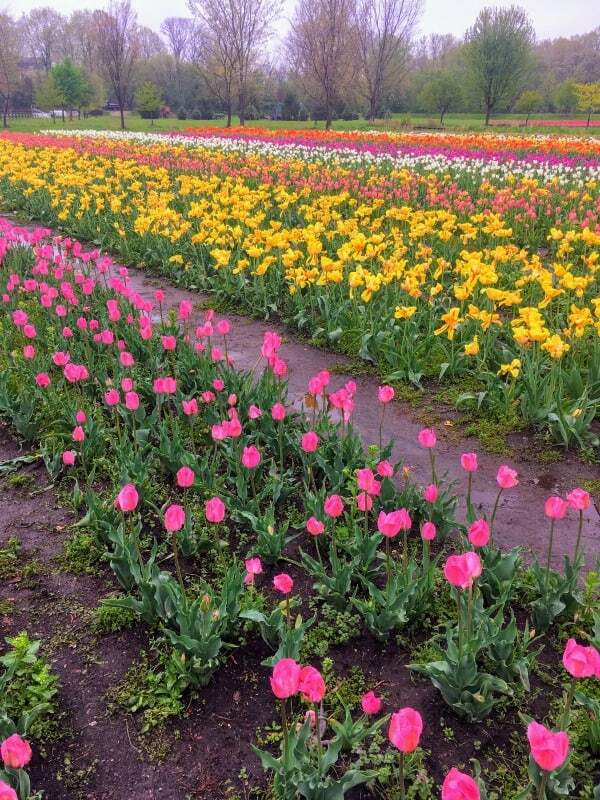 The island has a large tulip field in the middle filled with rows and rows of various colors of tulips. 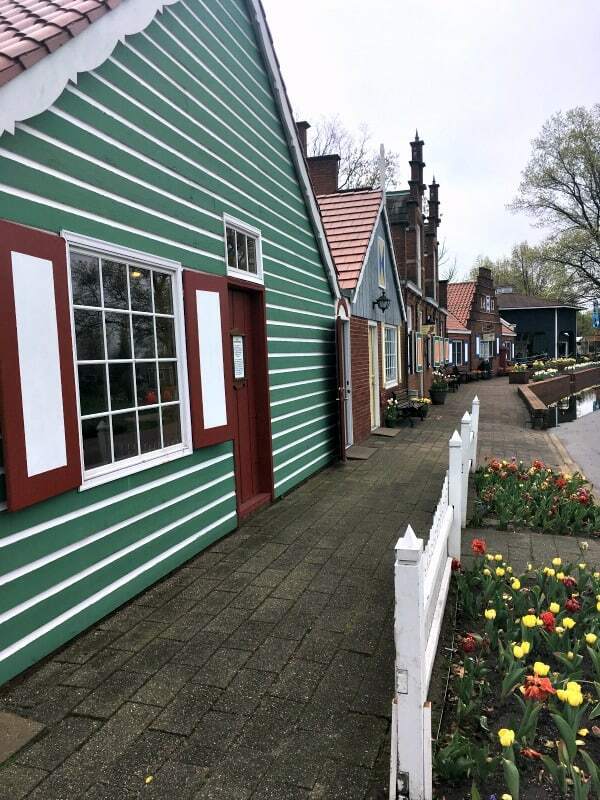 Near the entrance of the island you will find a replica of a Dutch village that is filled with Dutch souvenirs including Delftware and wooden shoes. With my husband’s Dutch genes’ need to view fields of blooming tulips filled, we went to fill my raised near the water need to see a large body of water. 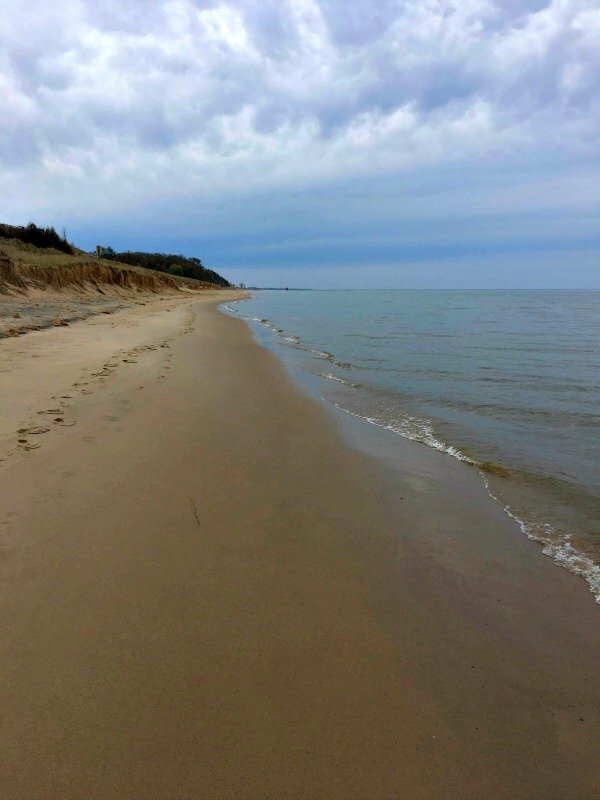 It might not be as big as the Strait of Georgia that I grew up on, but Great Lake Michigan is big enough to soothe my need for wild open water. Our first stop to view the lake was Tunnel Park. Tunnel Park is more than just a beach; it also contains a sizable playground for children with a wide variety of play equipment. 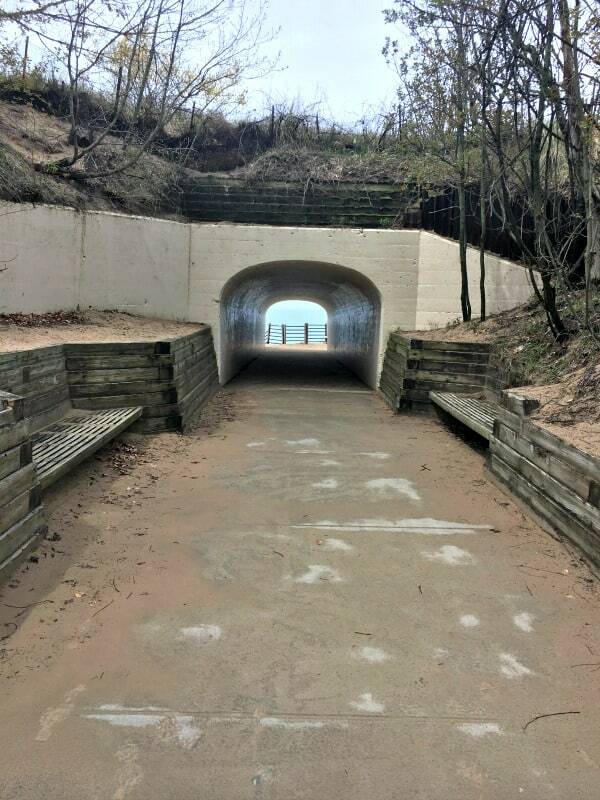 There is also a sand dune you can walk up or take the stairs to the top to enjoy the view. I haven’t tried this, but I am guessing sunsets at Tunnel Park would be amazing. Memorial Day through Labor Day there is a $7 fee to park inside the park, but we were there before those dates. 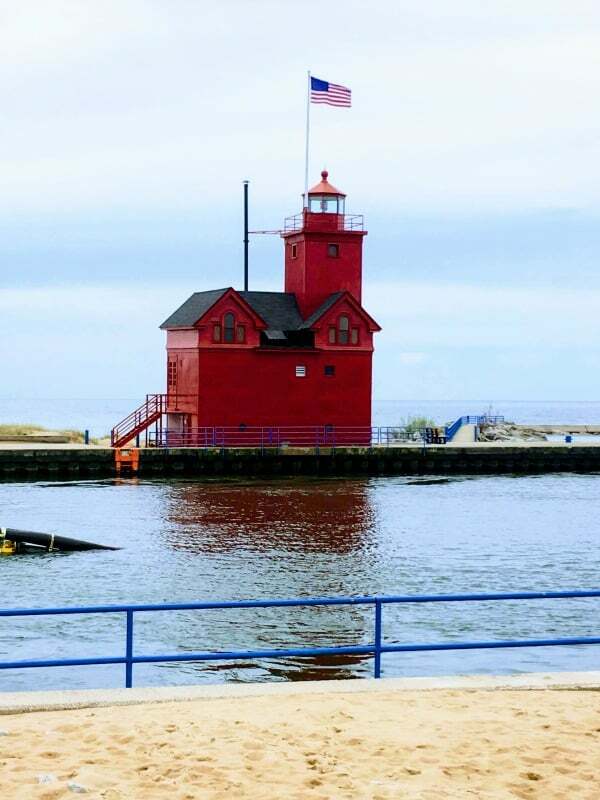 No trip to Holland, Michigan would be complete without a trip to Holland State Park beach to view Big Red lighthouse. 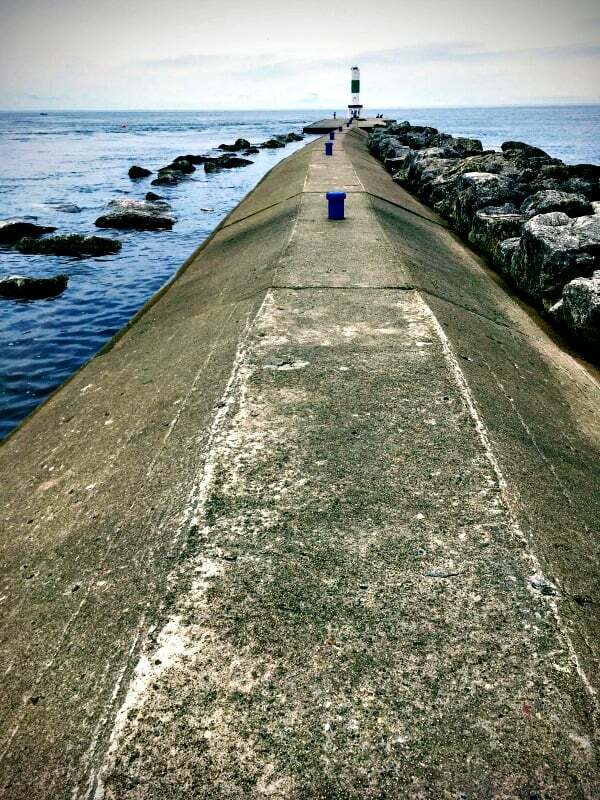 Nor can you leave Holland State park without walking out on the pier on the opposite side of the waterway opening from the lighthouse. 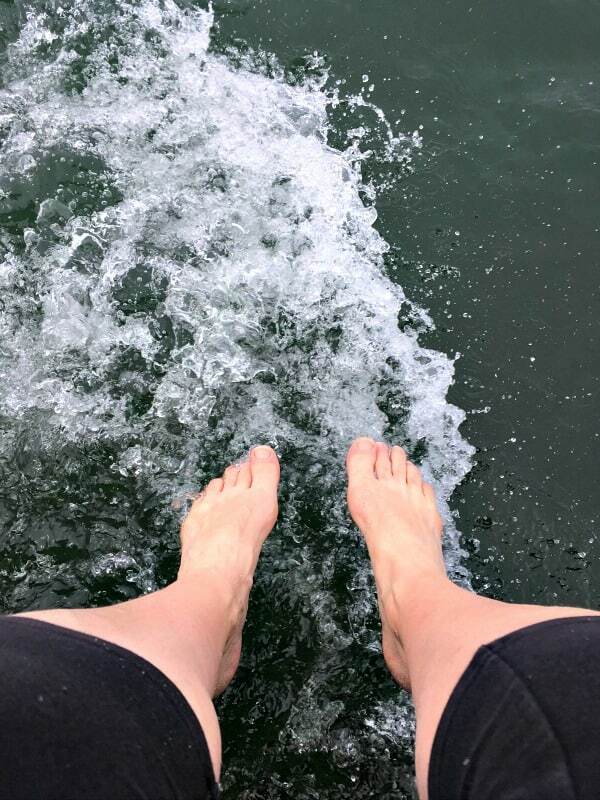 And if you are like me, regardless of the time of year you have to dip your feet into the water. Warning, the water is still very cold in mid-May. And for one last amazing view of Big Red and the shores of Lake Michigan, you need to climb all 239 steps to the top of Mount Pisgah. 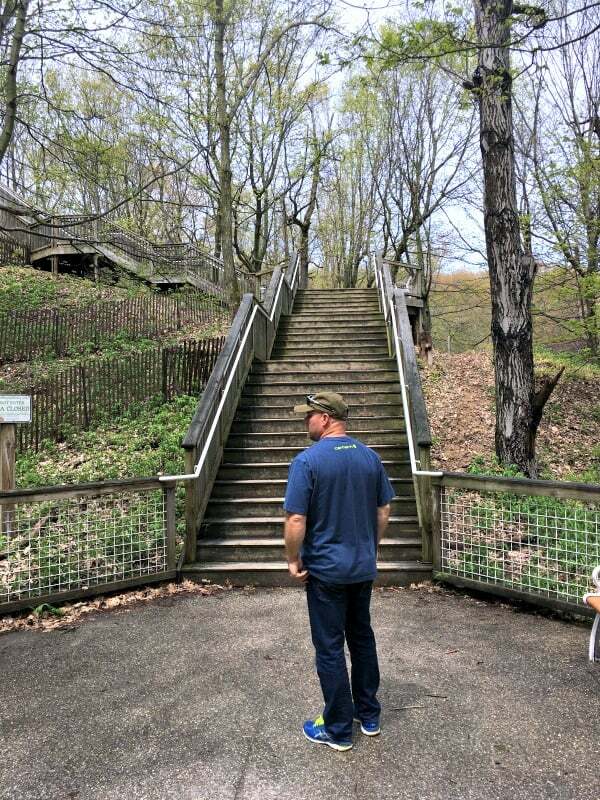 I am not including a picture of the view you will get from the top because that will be your reward when you explore Holland, Michigan for yourself. 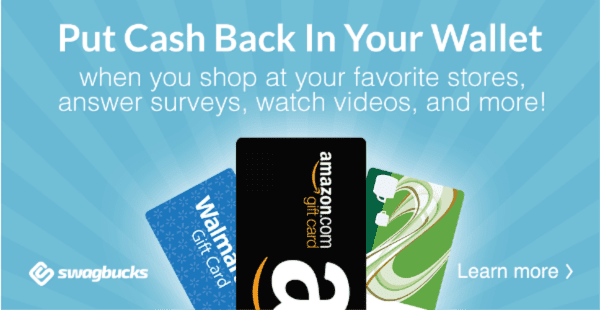 You Can Get Free Gift Cards For Shopping, Searching and Discovering What’s Online at Swagbucks.com.